This is from the series “Wood Expressions” and 5986 bottles were made. Sweet apple, honey melon and coconut in the smell. But don´t get your nose to close as it will burn your nose hair right off! So powerful in the taste, yet so sweet! 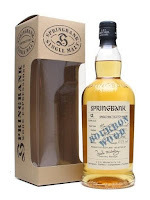 The alcohol is strong, but this might be the sweetest Springbank I have ever tasted! Sweet apples and pears and some exotic fruits. The finish is very sweet as well, but becomes more classic vanilla and honey sweet. The apples is still there and oak mixes as well. I really enjoyed this, but you have to be used to cask strength whiskies. It is very strong, but in the good way, and for once the classic Springbank characteristic is very hidden behind all the sweetness. I will give this 88/100 (21/22/23/22).